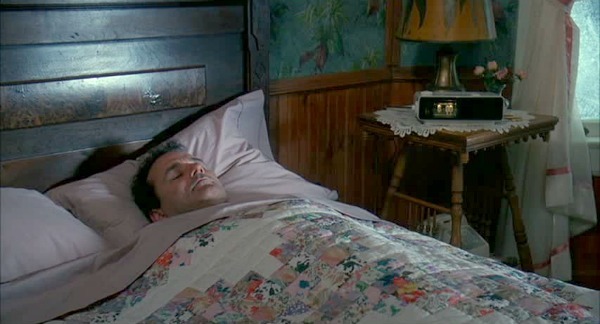 In honor of Groundhog Day, I thought it would be fun to take a look back at the 1993 comedy that still makes me laugh every time I see it. 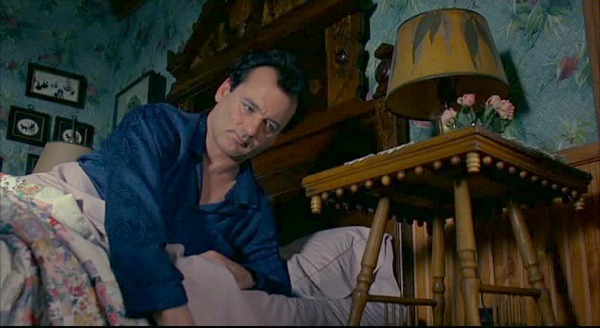 I always thought that if Bill Murray had to get stuck reliving the same day over and over again, at least he was staying in a charming Bed & Breakfast like the Cherry Street Inn, right? 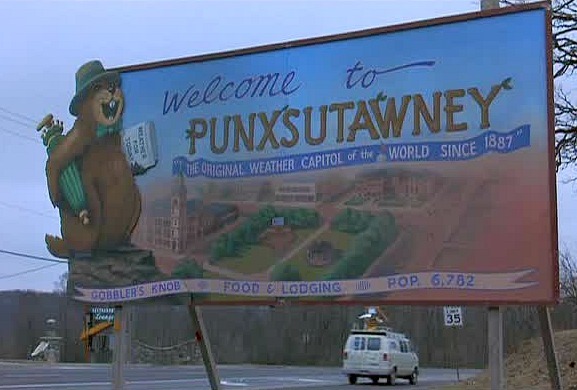 Bill Murray plays a weatherman who goes to Punxsutawney, Pennsylvania, to cover the annual Groundhog Day Festival, but the movie was actually filmed in Woodstock, Illinois, about an hour northwest of Chicago. 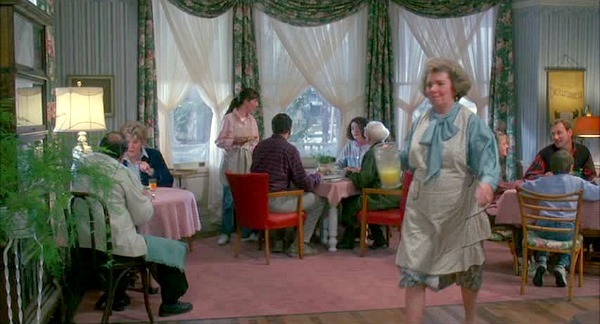 The interior scenes of the Cherry Street bed and breakfast were not filmed inside the actual house, however. The only times the crew entered the house at all were to turn on lamps for the proper lighting effects needed for the exterior shots. It was a private house at the time (not a B&B). They built the interiors on a soundstage in a warehouse nearby. Screenwriter Danny Rubin said he was inspired to write the story after reading Interview with the Vampire, which got him thinking about what it would be like to live forever. The original idea was to have him relive February 2nd for 10,000 years, but in the end, director Harold Ramis says that his ordeal probably lasted closer to 10. In the commentary they talk about how miserably cold it was when they were filming. 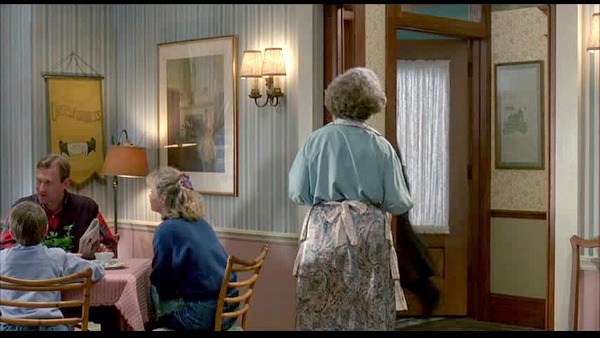 The innkeeper Mrs. Lancaster asks Phil every morning how long he’ll be staying. After the first day he doesn’t really know how to answer that! 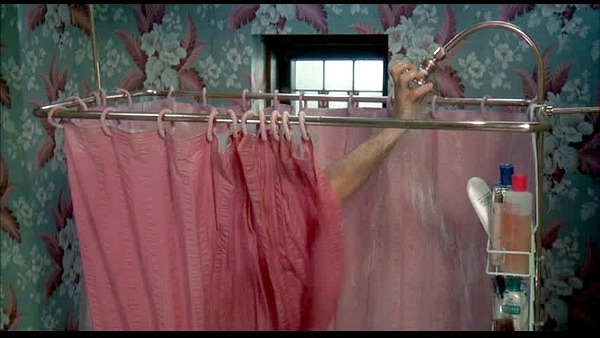 There’s a bathroom Phil has to share with the other guests down the hall. In the deleted scenes we see Phil mastering pool, taking bets on basketball games, and bowling perfect games. He also beheads the ice sculptures with a chainsaw in one. Early drafts of the script explained Phil’s situation by having an old girlfriend put a hex on him to teach him a lesson. In the end, though, they left it up to the viewers’ imaginations. 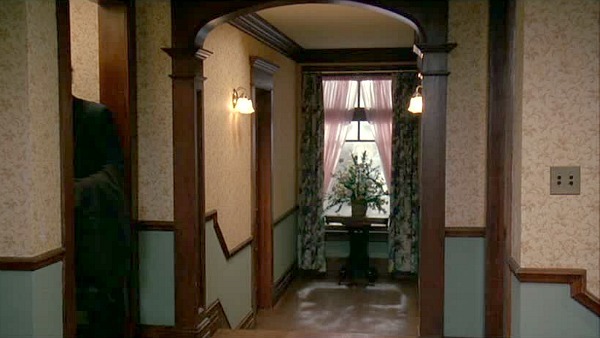 David Nichols was the production designer for the movie, and Lucy Fischer was the set decorator. 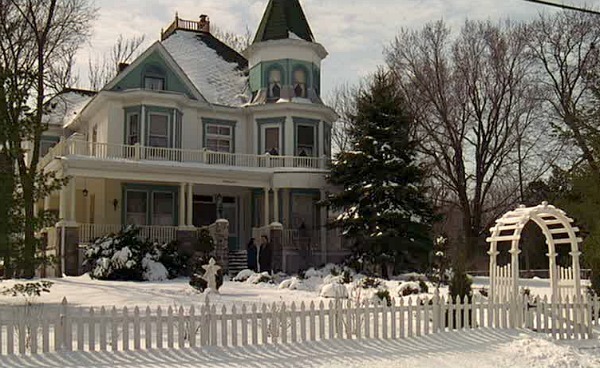 Fischer also worked on the house for the Christmas Vacation movie (see those sets here). 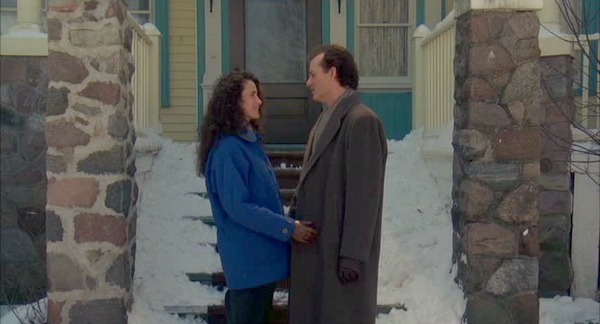 Andie MacDowell played Phil’s producer Rita who goes to Punxsutawney with him for the festival. When she visits him we see that he has a sitting area connected to his bedroom. 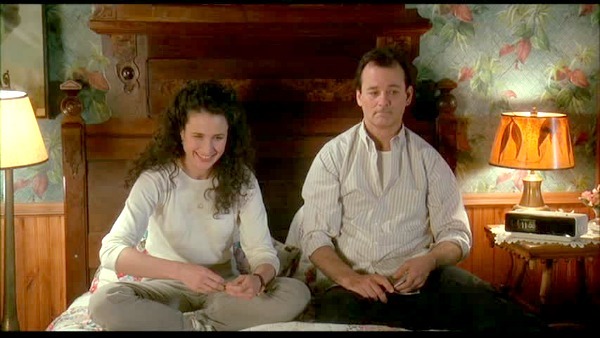 In the commentary they say that she got such a kick out of Bill Murray, she often couldn’t stop laughing during their scenes. I can’t resist showing you this coffee table in his therapist’s office. We had one just like that when I was growing up! Brings back memories. 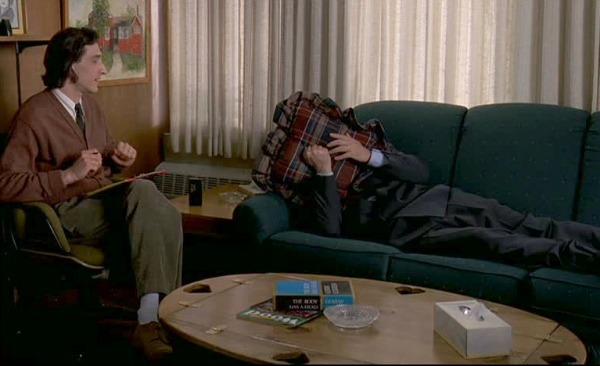 As do those plaid pillows and the hunter green sofa. If you had something similar in your house, raise your hand! 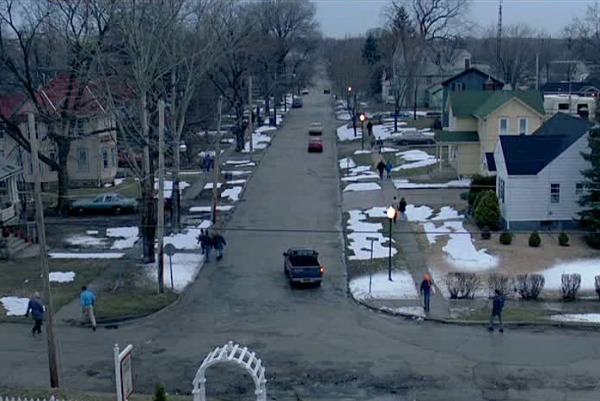 It was a big deal for the town of Woodstock to have this movie filmed there. It has become something of a tourist attraction since then. Remember that pothole full of icy water Phil plunges his foot into each morning on his way to Gobbler’s Knob? It’s bigger than it looks, with over 6,000 square feet. 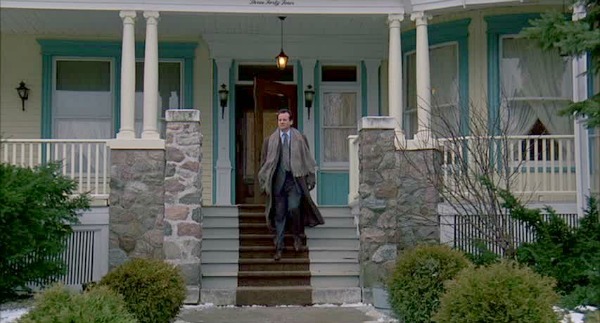 If you ever want to stay at the Royal Victorian Manor for Groundhog Day, make your reservations early. The rooms fill up fast! *2018 Update: Sadly, it seems to have since closed. 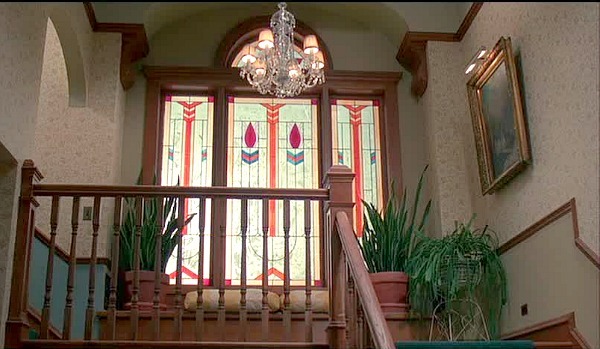 Inside Halliwell Manor: A House That's "Charmed"
This is my favorite comedy. One of Bill Murray’s best. Every time I scroll through the channels and see it running even if it’s halfway through I have to stop and watch it. Captivating post Julia! What a great old Victorian…. 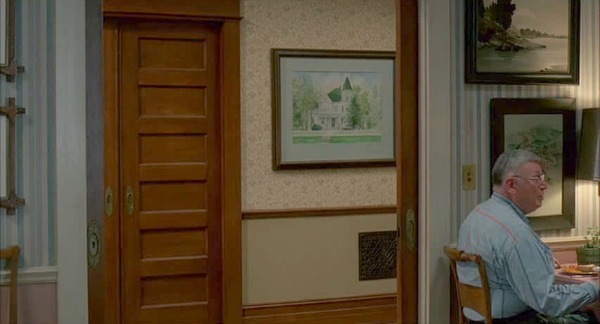 too bad they couldn’t have actually filmed the interior scenes inside the actual house! I hope they play that movie today! 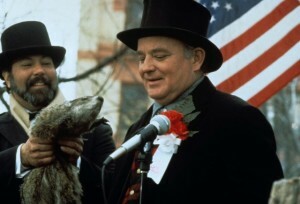 I need my Groundhog Day fix!! 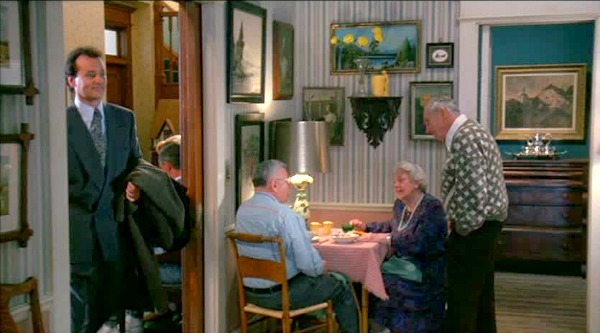 It’s such a lovely house with so much potential…thank you for posting photos….it’s too bad the current décor does not do justice to the home. It could’ve looked so much prettier!!! What a nice post to read today. 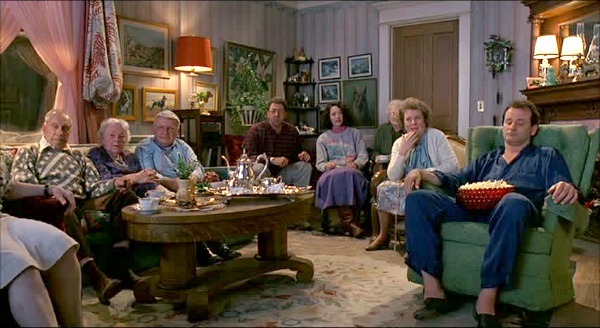 Every time it’s groundhog day, this movie always comes to mind. It’s such a funny comedy and I can’t get enough of it. Especially because of Bill Murray. He’s such a funny actor. Thanks for letting us take a peek inside the actual house. It’s such a beautiful place, but I prefer the movie sets. That’s right, I totally forgot. 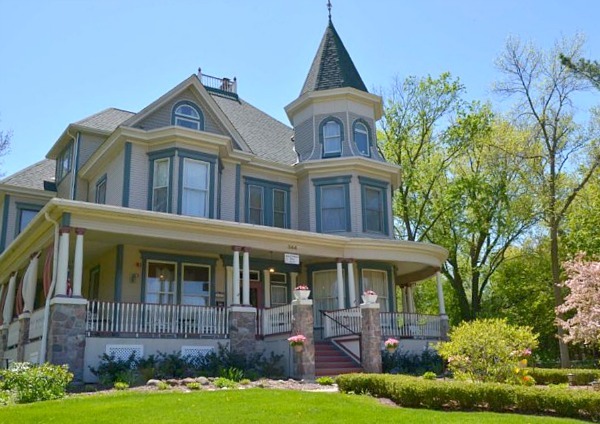 It is definitely one my favorite Victorian homes. Fun post, Julia! Love this movie. 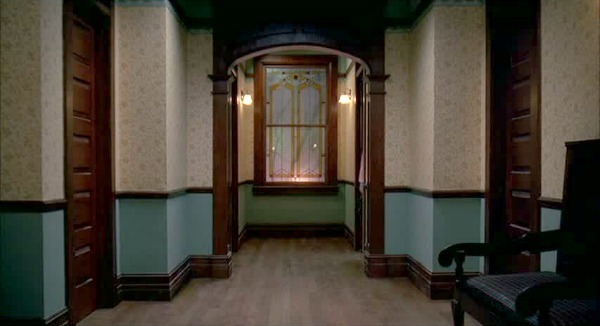 Boy, they did a fabulous job creating the interior of a Victorian for the sets! They fooled this old house lover! 🙂 The real interior is pretty, but I find it a bit earthy and dark. The neighborhood looks a lot like the small town I live in. 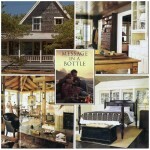 I’m sure it will remind many of your readers of their own small, North American towns. Have a great week and keep warm! LOVE that movie! 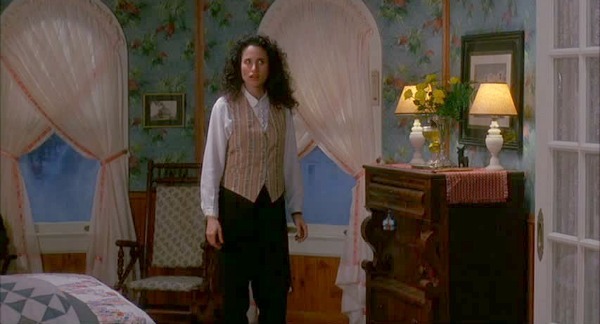 Andie McDowell lives in the Asheville area, and I’ve seen her up close and in person. She’s just as beautiful and gracious in person as on screen. I should say ‘lived’, though she still owns property in the general area, I believe. 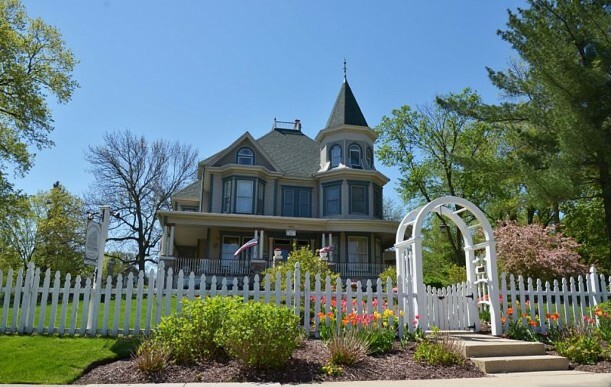 What a gracious Victorian home – so wishing the groundhog had not seen his shadow…can hardly wait for the first signs of Spring!! Great house, I can see how it makes for the perfect B&B. That is one huge house to have a ballroom on the third floor!….to play in there as a kid must have been fun. Such a funny movie. 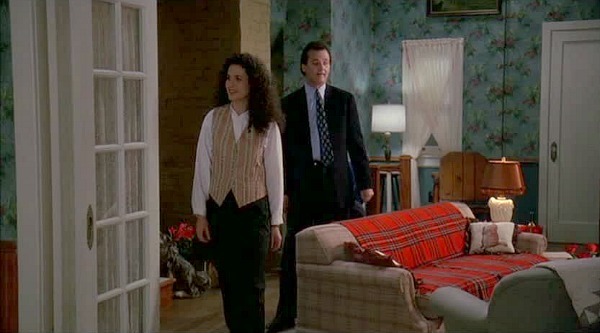 My other two favorites of Bill Murray are ‘What About Bob’ (which has a great house by the lake which I believe you featured on your blog some time ago), and also ‘The Man Who Knew Too Little’. 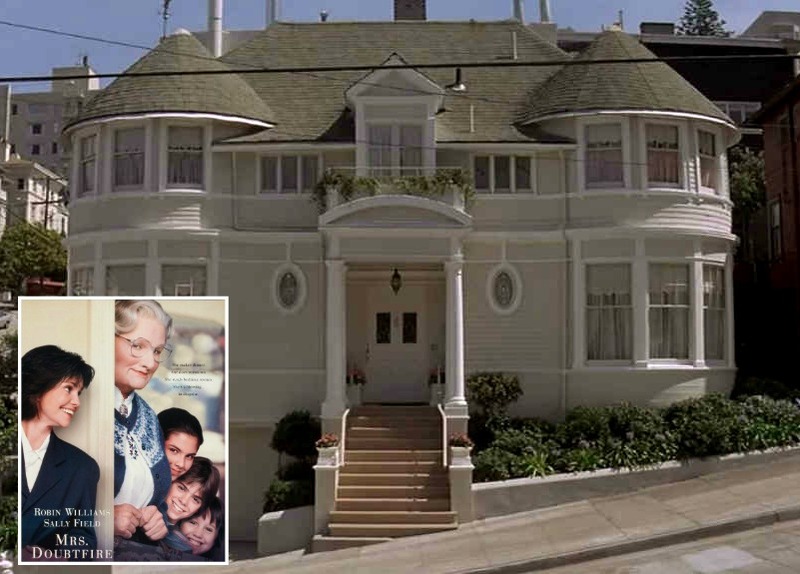 I actually live about 10 minutes from this house, my husband and I took our two kids to watch filming, very interesting! There were tons of people lining the street, my son was about 4 and when he saw Bill Murray he yelled out “it’s the ghostbuster dude” …Murray heard him, walked over, picked him up and we got a picture. Nice guy! Fun to see some of how a movie is done, cameras rolling on train tracks, but Murray made our day! Ooh, fun! I love that. Must make watching the movie even better, having been there to see them filming it! Yes it was…if I remember right Bill’s response was “wrong movie kid”…he was so nice to everyone! I love older homes. Aside from that, can we have an internet moratorium on the phrase “former glory”? I don’t know why it is, but that phrase makes me literally cringe. I can’t be the only one who feels this way. Thank you. Real estate agents love that phrase. I’m afraid we aren’t getting away from it any time soon. Sorry! What a fun post! I love that movie so much. It’s a comedy, but, I believe it has some serious parts. 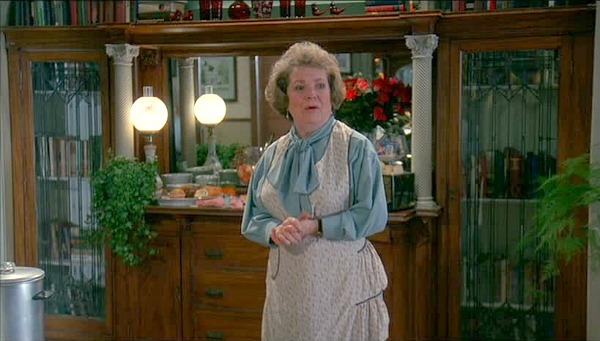 The one that always gets me is when he tries to save the life of the homeless man who dies on Groundhog Day , and the nurse who tells him that ” it was just his time.” Thanks for sharing! I agree — that scene gets me choked up every time! 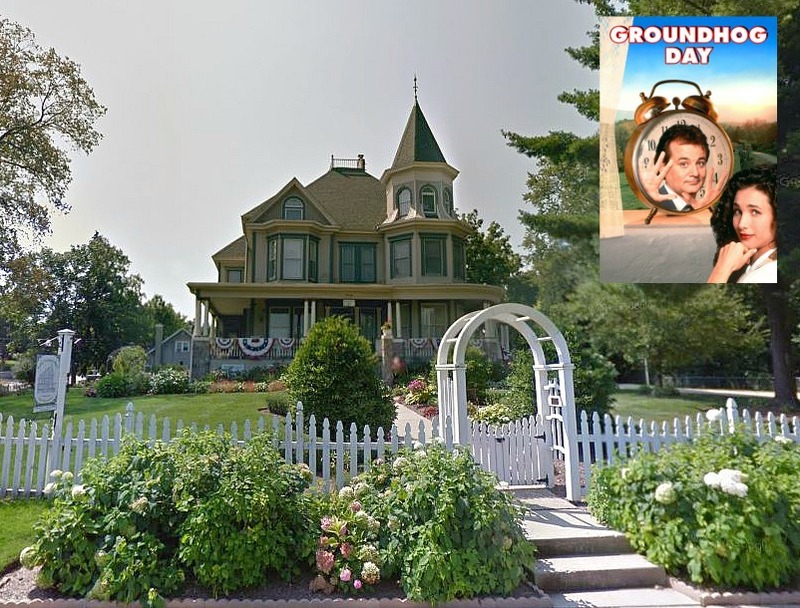 The house from the Bill Murray movie “Groundhog Day” is now for sale, the listing for it is below.